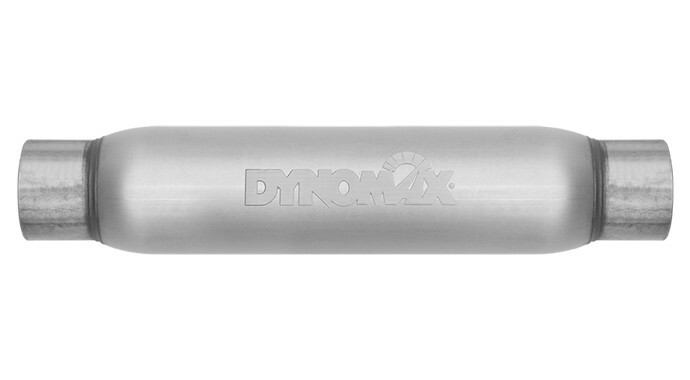 DynoMax® Race Bullet mufflers feature 100-percent welded construction for lifelong durability. The 'Pure Unadulterated POWER' and lightweight, compact design make it the ultimate race muffler. The unrestricted, straight-through design is dyno tested and track proven. Each muffler uses our exclusive Continuous Roving Fiberglass (CRF) Technology which helps provide up to a 4 dbA sound reduction, on most race applications, while maintaining a deep race tone. CRF Technology which helps provide up to a 4 dbA sound reduction, on most race applications, while maintaining a deep race tone.